Once you have created an Opportunity and you have added some items to the Quote associated with the Opportunity, you are ready to create a Proposal. To create a Proposal, all you have to do is go to the Quote you have created and click "View Proposal" icon. This will result in viewing the Proposal the same way they will see it. You can also show this to them if you meet with them in person. All Proposals will be using some template. This may be one created for you by D-Tools, by someone in your organization, or maybe you have created a few of your own. When you are preparing a Proposal for a Quote, you can select from the different templates. You may want to change the design slightly to best fit your client. You can do this by clicking the ellipsis more menu (...) and then edit proposal. Here you can add, remove, or edit different sections in the proposal to customize it as your own. You can also choose from your saved templates, or save a new template based on your updated design. Learn more about editing proposal. After you have presented the Proposal to the potential client, they will probably want a copy. You can share this proposal by hovering over the "View Proposal" button and click Share Proposal. You will be prompted to enter an email address to share to and an optional message to the potential client. You can also share the Proposal internally without the client seeing it. After a Proposal has been shared through email, D-Tools collects some analytics to show you who has opened the proposal and how many times they have opened it. 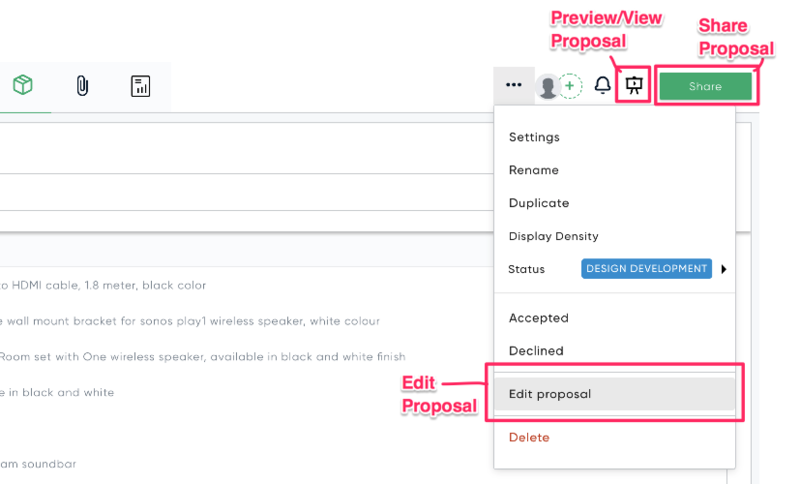 Hover over the "View Proposal" button and choose Proposal Analytics.